1. 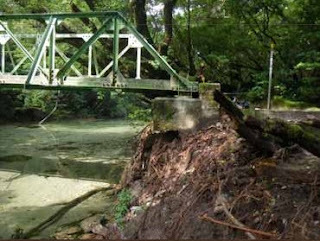 NEW: From 25th November 2010 for 2 weeks the Miyanoura Tozando bridge will be closed for repairs and hikers therefore cannot use the Yodogawa Path to climb Mt.Miyanoura. 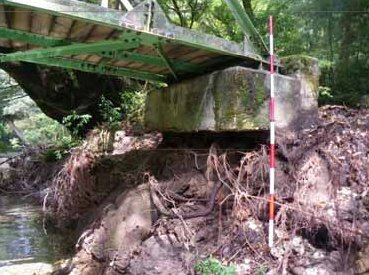 Miyanoura Tozandou, the bridge metres away from Yodogawa hut, has been closed due to damage sustained during rainy season. As can be seen from the pictures below, the base has been exposed and has become unstable. 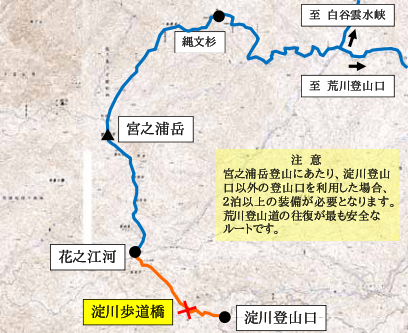 For those hikers who wish to go to Mt.Miyanoura, take the Arakawa trail or Shiritani to get to the Okabu trail and then go past Jomon sugi or take the much longer trails via the Ishizuka trail from Yakusugiland, the Kurio or Yudomari trails via Hana-no-ego marsh or Nagata or Hanayama trails (This is where my book comes in handy). 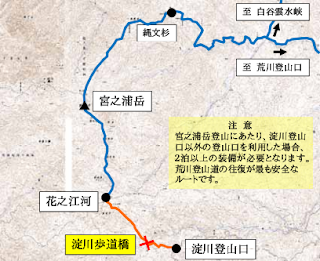 The easiest would be via the Okabu trail but all trails will take longer than one day so go with the right equipment.